Faster Roll-out, Cost Savings, Standardized Architecture – leads to Differentiation. Award-winning solution, received the Network Transformation, Cloud & Carrier Service: Best vCPE/uCPE Enterprise Service at the SDN & NFV World Congress, 2017. 1/10 the cost of Infrastructure Closed Source Solutions, and Five times Faster Time to Production. Cloudify and VMware delivered to Partner Communications the solution in just six months. The team first deployed automation for the manual steps of setting up and configuring physical network functions and firewall services on Partner Communications’ existing VMware platform. 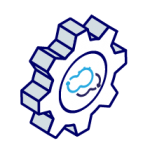 Cloudify then deployed the new VNFs over their hybrid cloud environments, automating lifecycle management. This made it possible to correlate information gathered from both software platforms to deliver improved performance and utilization of the underlying hardware. This innovative “automation first” approach focused on designing and deploying the NFV orchestration and automation capabilities first atop the company’s existing network infrastructure (physical or virtual). This enabled new virtualized network services to be deployed in days or weeks rather than months. After the initial services were automated, and quickly consumable in a self-service manner, new technology was introduced incrementally, making the transition to self-service, open vCPE and SD-WAN much less painful and time-consuming. Learn how Cloudify delivers open vCPE & SD-WAN to your organization in this demo. Achieve a rapid self-service experience for installing, configuring and managing all of your network services – from firewalls and routers through load balancers, IPSEC tunneling, signaling and more, whether on-prem or at customer premises or branch offices, through a central management portal. Watch the presentation from Open Networking Day Tel Aviv by Partner Communications to learn how they achieved NFV enablement and SDx with full end-to-end and closed loop automation through the one-click self-service vCPE & SD-WAN solution built by Cloudify, with all the needed value-added services for all their customer branches.